A raw foods diet does not deprive individuals of food, it is merely an alternative, and perhaps superior, way of food preparation. Eating a majority of raw foods does not necessarily limit the kind of foods you enjoy. Rather this type of diet simply gives you more of what you use food for: Nutrition, pleasure, health, strength, etc. Eating food 'in the raw' is simply an alternative way of food preparation that will totally benefit you in a huge way. A great recommendation of a raw foods diet is from Janne of the website Natural Health Zone. She calls the raw food diet "an amazing experience". I LOVE her enthusiasm and I am sure that you will too! Read her raw food testimony in her own words at www.Natural-Health-Zone/raw-food-diet.com. Here are some links and definitions that you will commonly find among those who enjoy a raw foods diet. 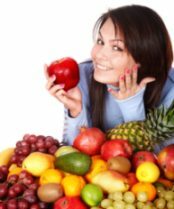 Eating A Raw Food Diet - The concept of eating raw foods is different to the people who embrace the raw foodist philosophy. Raw foods includes food that is unheated or warmed to a temperature no greater than 118 °F (48° C). Many who eat a raw foods diet are vegans who exclude all meats and animal products such as eggs and dairy and sometimes even honey. There are others who include all types of raw daily products, even raw animal flesh, raw eggs and raw fish. The choice is personal and entirely up to you. Starting A Raw Food Diet – Eating more raw foods or going totally raw is a change and a bit of a challenge. Follow the link for tips to help you get started. Raw Food Diet Meal Plans Until your new way of eating becomes second nature, you may need a plan. A raw food diet plan is simply planning what you are going to eat, what you will make for yourself and therefore what you need to buy in order that you will always have something to eat. Having a plan for your new diet will help you stay the course. Just like you would plan on eating your sandwich for lunch and hot soup for dinner, planning with raw foods is no different, it is just that all your foods now will be raw. Carol Alt Raw Food Diet – After the seed idea of a raw food diet was first introduced to me, I read an article about supermodel Carol Alt. It was her philosophy of raw food that clarified the whole raw food diet to me, personally. My own pattern of eating raw foods is patterned about the Carol Alt raw food diet. Thanks Carol! Raw Food Cooking – If for any reason you think that eating a raw foods diet as a way to eliminate cooking, well stop reading now. In the world of raw foods, there IS such a thing as raw food cooking. The word “cooking” has to be defined. A better term would be 'raw food preparation'. As with any food prep, raw food does not get you out of the kitchen, but it will get you out of a HOT kitchen. Raw Enzymes - The enzymes found in raw foods are critical to our health and well being. Foods High In B12 - Non-meat and non-dairy foods that have B12 are hard to find. This page will give you some ideas! B12 Deficiency Symptoms - B12 deficiency can be concerning to raw foodists and vegans. Raw Foods Diet for Pets - Pets can benefit from a raw foods diet just like you! Raw Agave Sweetener - A great option for those not wanting to use honey. Raw Stevia - A great raw option for a sweetner. Raw Eating While Traveling - If you are "on the road" a lot and still want to eat raw, then here are some tips on raw eating while traveling. Raw Food Communities - The strong belief in raw food and the basic need to eat has naturally resulted in the formation of raw food communities. These raw food communities can and do range from the privacy of family members, to virtual online raw food groups, to schools and restaurants specializing solely in raw foods.